Winsor and Newton: Naples Yellow, Prussian Blue, Alizarin Crimson, French Ultramarine, Cadmium Red, Cadmium Yellow, Permanent Sap Green, Burnt Sienna. Daniel Smith: Cobalt Teal Blue, Pyrol Crimson. Schmincke: Translucent Orange, Manganese Violet. I keep these in a metal travel palette by Daniel Smith that has racked up a few miles over the years...keeps on truckin, though. No, I don't use the waterbrush shown anymore; it's in there for structural reasons. I carry a very nice set of Escoda travel brushes in a nifty leather wallet that i found in an art store in Girona, Spain. That's all kids...keep dreaming...keep drawing! Hi Cindy--I use Cadmium Red, Prussian Blue and Ultramarine Blue, Cadmium Yellow and Naples Yellow. 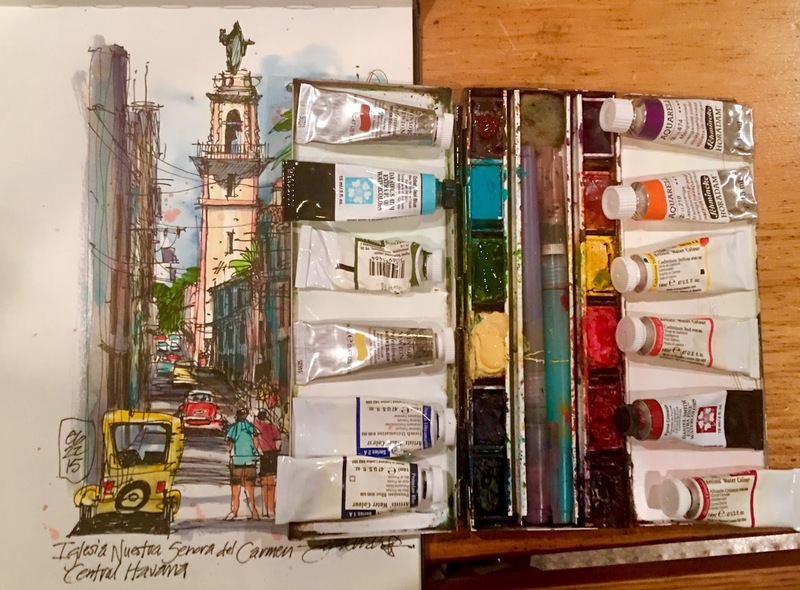 James, as I read that you're using a Daniel Smith travel palette, I wonder why did you stop using Daniel Smith watercolors vs why do you prefer W&N ...? Hi Mamen. 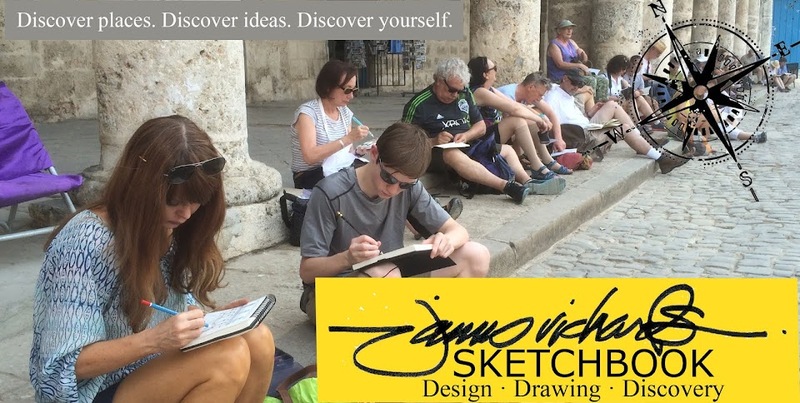 Like most of my friends who sketch on location, I use a mix of brands to best serve my own style and the subject matter I choose to sketch. I've used W&N watercolors since the beginning, and a year or so ago added the Daniel smith colors that are listed above. I bought the travel palette with empty pans to accommodate my personal preferences.